A canopy bed may sound exotic and out of reach. But really, a canopy bed can be made with a simple swag of fabric or by constructing an elaborate draped treatment for your bedroom. The easiest way to create a simple canopy for your bed is to hang a piece of fabric over the top frame rails of a structured canopy bed. But if your bed doesn't have a canopy frame, there are other ways to get the look of a canopy and to surround your bed in softness and color. You can achieve a very attractive canopy bed look by installing curtain rods to the ceiling, placing one over each end of the bed. Using either tab-top, tie-top, pinch-pleated or gathered panels, attach the fabric to each curtain rod and let it drape softly to the floor. You can also attach a short rod to the ceiling, perpendicular to the head of the bed on each side. Hang the panels to the floor and tie back with a drapery tieback. A dramatic crown canopy, also called a coronet, looks elegant in any bedroom. Attach panels of fabric around the outer edge of a half-circle of 3/4" plywood. This half-circle can be attached directly to the ceiling or floated just off the ceiling with L-brackets attached to the wall. You can add a romantic look to a plain-Jane bed by draping long fabric panels through a wooden or metal ring attached to the ceiling above the center of the head of the bed. Draw the fabric panel through the ring, pulling it down to the floor on either side of the bed. Spread the panels out to display more fabric and frame the bed or drape the panels around the bedposts at the head of the bed. Another simple treatment is to install a ring on the ceiling at both sides of the head of the bed and draw the long fabric panel through both rings. Swag the area between the two rings at the ceiling to form a lush top frame for your bed. The panels should extend to the floor on both sides of the bed. If you install 4 rings, one at each corner of the bed, try drawing a long panel of fabric through each one. Be sure one end of the panel at each ring goes all the way to the floor. With four panels of luxurious fabric draped above and down the sides of your bed, the look is very elegant. You can really use any type of fabric you want to create a beautiful canopy bed. Traditional fabrics for canopies are chintz, silk, velvet, or tapestry. But you can achieve a fun look for a country setting with muslin or gingham or charming calico. You can also use sheets that coordinate with your bedding to construct the long panels for a uniform look. 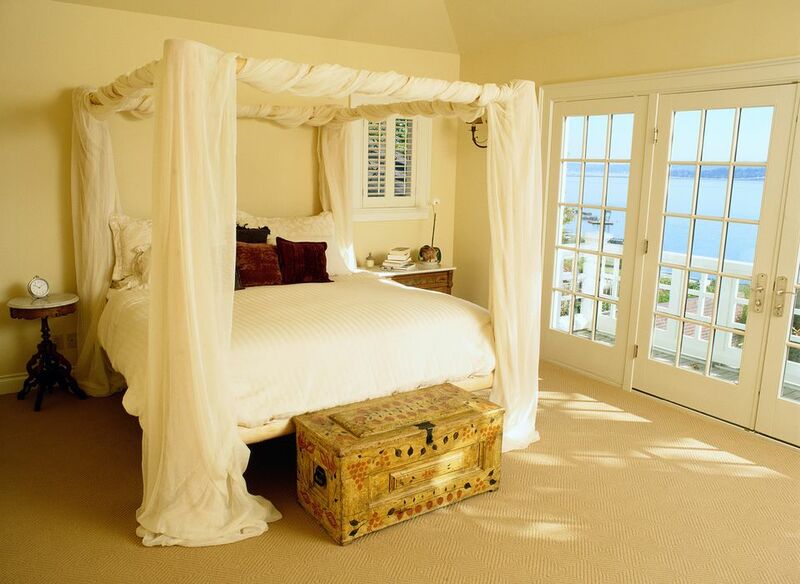 For ease of use and simplicity of style, bed hangings are generally cut to touch the floor when hung. If you prefer a luxurious look, cut the panels 4" longer and "puddle" the fabric on the floor at the edge of the bed. Be sure to lift the panel when you need to vacuum the floor. For a truly professional look, more body, and longer wear add lining to the panel of fabric or use a coordinating print or solid for the back of the panel. After all, the inside and outside of the panel will both show when you swag it. Add borders, fringe, ribbon trim, and cording. Coordinate trims with tiebacks, adding color, texture, and body. Remember that a tieback will pull the fabric off the floor, so cut the panels slightly longer.